UPP is an active network of artists, educators and activists working within and along side community groups (young and old-er) to nurture creative dialogues which can take place inside, beyond, and between communities. Our members are scattered across the globe but are currently based in the US, Scotland and Guatemala. We currently have three core members who are responsible for the overall delivery and development of the Unfinished Picture Project. They make sure everything keeps ticking and keep their eyes peeled for new ideas and opportunities. Most projects delivered through the network have a coordinator – who is responsible for liaising with local community groups, international partners, and practitioners (who prepare and deliver/facilitate the workshops). Some of our projects are run a bit differently though, such as Dialogue for Destitution. Here’s a brief introduction to some of our core members, coordinators, and practitioners past and present…more people coming soon! Minka Stoyanova is a New Orleans, Louisiana (USA) native artist and designer who believes Art is not only capable of, but is a key component to the creation of positive social change. Artists are able to initiate dialogues that elicit emotional and intellectual responses by expanding accepted boundaries. She attempts to create work that bridges the gap between the intellectualism of Fine Art and the everyday wo/man. Minka is very interested in using community and public art, to address systemic issues. For this reason. she engages directly with communities in order to give voice to under-represented groups. She has conducted projects in Costa Rica and New Orleans, and is excited about starting a broader, international endeavor. Minka’s personal experiences, including a six-year enlistment in the United States Air Force and being raised in a low-income, urban community, have impressed upon her the necessity of creating harmony in an oft times discordant society. Minka Stoyanova holds a technical degree in Emergency Management, a Bachelors of Science in Internet Applications and Media Arts, a Bachelors of Art in Fine Art Photography and is currently pursuing a Masters of Fine Art in Glasgow, Scotland. 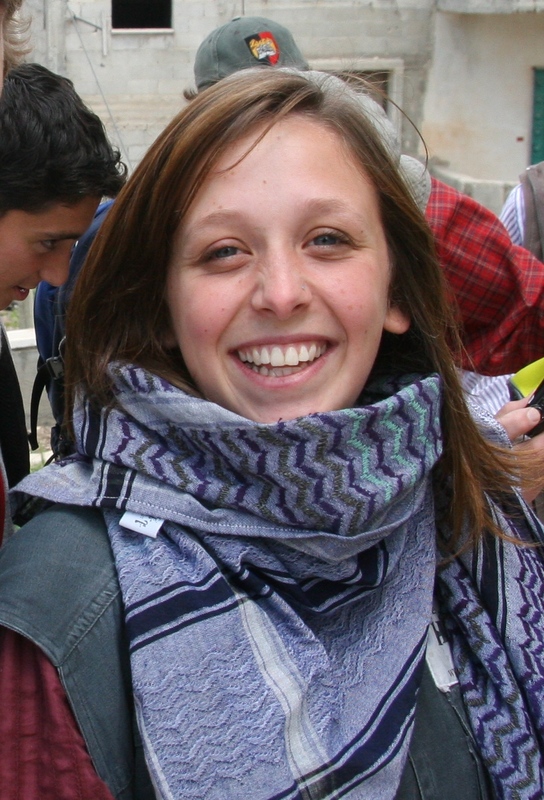 One of the founding members of the project, Nicky has been involved in branch set up in Nablus, Balata and Scotland as well as Organizational Development generally. Her main interest is in the media aspect of the project, particularly in terms of curriculum development. Nicky studied Social Anthropology with Development, which included carrying out fieldwork with an indigenous community in Canada as well as a year studying community education. Whilst at university she took on a variety of voluntary roles with community education groups in Edinburgh. She gained an English teaching qualification, before coming to Palestine to teach Blogging, English and Football, and later worked as a journalist covering stories on a variety of social issues, including women’s rights and forced displacement. More recently she has been involved in advocacy and support for refugees and asylum seekers in Glasgow. alma is an Arab Immigrant to the United States. Detroit is the city she feels most affinity to in the US. Barcelona is where she wants to grow old. Amman is where she grew up and where her family lives. alma writes on love for JO Magazine and about everything else for The Seattle Globalist. She is also the Marketing & Outreach Coordinator at Central District Forum for Arts & Ideas. She works with youth so as to learn more about herself and others so as to broaden her world perspective and become an active individual in the world, with the hope the youth experience the same. She has her Bachelor’s degree in Environmental Science from University of Michigan-Ann Arbor and an MA from Rhode Island School of Design in Community Art Education. Oh, what a tangled worldwide web we weave: Emma and Jonathon met in Korea in 2005, joining forces to become one the world’s elite transatlantic (Emma’s British, Jonathon American) EFL-teaching teams. They have now lived and worked together in six different countries, including two separate terms in Guatemala and one fortuitous occasion in the Palestinian West Bank. While volunteering in Nablus, Emma and Jonathon, who by then were known to many as Emmathon, became acquainted with none other than UPP founder Nicky Bolland and Seattle director Katie Schuessler. Emmathon’s second stint in Guatemala coincided with the formative years of Unfinished Picture Project, and in early 2010, Nicky contacted Emma about working on an international mural together. Unfortunately, due to conflicting schedules, the collaboration never go underway. However, during the following year, Jonathon and Emma piloted a program for another NGO, Las Manos de Christine, providing sustainable art and English classes, as well as school supplies, to the mountain village of El Hato. Meanwhile, Nicky, Minka, and Katie fostered UPP into the substantial organization before you today. So, finally, here we stand, Emmathon again Guatemala-bound, this time to work as representatives of UPP. From June through August of this year, Emma will be doing a textile art project with kids in El Hato, and Jonathon will be maintaining the web-based components, as well as contributing regular newsletters and helping to develop UPP’s The Big Picture. Jonathon and Emma hope to create an educational, motivating, and liberating program that can be taken to other towns and villages in Guatemala, throughout Latin America (where they will be in the coming year), and beyond.